Tim Barber Ltd.’s interior architecture designer, Patrick Tennant. Photo by Evan Koester. Tim Barber Ltd. is a residential architecture studio and has been for the past 24 years. Nevertheless, prospective clients occasionally call to inquire whether we can give their home a “face lift”, ranging from picking out wall colors and papers to sourcing furnishings and decor. Technically, we can do that, and up until 2012 (when we pared down both our name and operations from Tim Barber Ltd. Architecture & Interior Design to Tim Barber Ltd. Architecture) we occasionally did do interiors-only projects; however, nowadays, we typically don’t. “We’re a fully integrated design team, and within that team, we have a secret weapon: a dedicated interior architecture designer,” Tim reveals. But how are they different from an interior designer? “Interior architecture designers specialize in creating the useful and decorative elements permanently attached to your home that you can’t take with you if you move, like built-ins, or the molding, millwork, paneling, beams, tile, stone, plumbing, and floors,” explains Patrick Tennant, Tim Barber Ltd.’s interior architecture designer. Many of the interior designers that we work with focus on curating a home’s more easily changeable and/or portable aesthetic features, like paint colors, wallpaper, furniture, decor, and soft goods. “A good project needs both,” Tim notes. Unlike some interior designers, Patrick is also deeply engrossed in design ideation early in a project’s timeline. “I’m on the design team, getting to know our clients from almost day one, but clients get to know me only in Design Development (the third phase of our architectural design process),” Patrick continues. Patrick returns at the end (during construction) when we’re ready to begin interior finishes and need to coordinate with the interior designers, who are sometimes just starting their work. “Patrick is resourceful, artistic, a good listener, and a dynamic, effective team player,” Tim praises, echoing appreciations I’ve heard many times throughout our office. And it’s true: Patrick is a boon to both our clients and team. “The architects think on a macro level. Devoting someone to only interior architecture design allows them to stay focused on the big picture. I think that’s part of why Tim created my position, and why we’re so successful as a team. Contractors, engineers, and other collaborators frequently tell us that we have the most detailed drawing sets they’ve ever seen, and we achieve that because of how we’re structured,” explains Patrick, who scrupulously sources a wide array of surfaces, fixtures, and features for each project, and then documents the final choices in extremely detailed appliance, finish, plumbing, and tile and stone schedules. In addition to creating schedules and interior architectural details, Patrick provides another rarified service: hand-drawn elevations and renderings. “Our team and consultants read architectural drawings every day, but it’s important for us to remember that our clients generally don’t. Illustrations can give clients a sense of their future home’s volume, and also an understanding of the detailing, or what things are in front of others. For example, I shade my elevations (which are an entirely different format from architecture elevations) to show elements in front of or behind another, which helps show depth,” a technique Patrick developed during an earlier foray into theatrical set design. 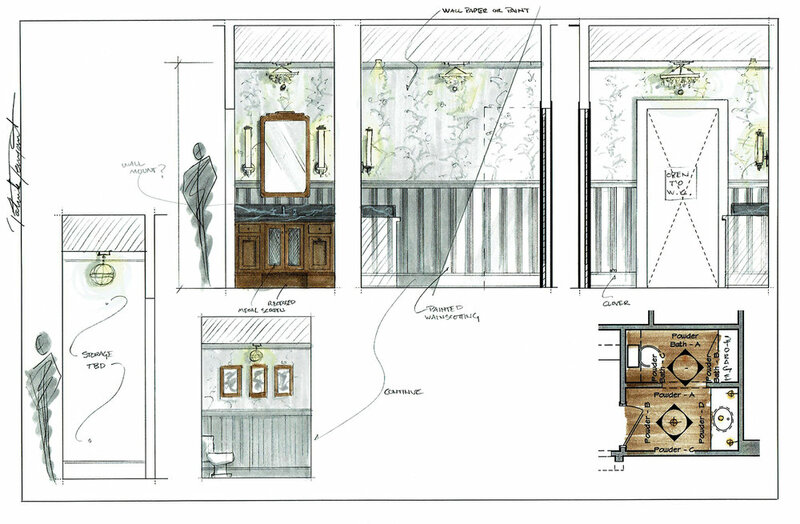 Elevations of a breakfast area and built-in kitchen work station for an in-progress project, designed and rendered by Patrick Tennant, 2018. Elevations and floor plan of a powder room from an in-progress project, designed and rendered by Patrick Tennant, 2018. A highly skilled artist, Patrick often plays a critical role in helping clients visualize their stories using hand-drawn renderings. “If and how we create renderings depends on the client. Some want photorealistic digital renderings, which are fine; however, hand-drawn perspectives, which I do, bring a human element to the table. It’s a romantic document that communicates an idea and feeling,” Patrick stresses, noting that some clients find the ephemerality of hand-drawn renderings significantly less scary than the lifelikeness of digital renderings – especially in the early stages of design, when clients aren’t quite ready to commit to a particular scheme. “Renderings sometimes help clients make decisions because they realize, ‘Wow, that’s my house!’ It’s emotional. They’re so much more than just quick pen and pencil sketches,” Patrick explains. For the clients who request them, Patrick’s renderings are often the missing pieces that help make complete sense of the plans and elevations. They are detailed enough to convey ideas about a space, but sparse enough that clients can envision their own colors and furnishings in the room. Plus, some clients just really enjoy the drawings for what they are: art. Patrick’s design rendering for the Jonathan Club’s new barber shop and lounge, which Tim Barber Ltd. recently completed under project manager Katie Peterson. Photo of the Jonathan Club by Charles-Ryan Barber. Patrick’s preliminary designs for the renovation of an eclectic West Hollywood penthouse, which he project-managed. As the primary designer of this four-room architecture + interior design project, Patrick created his own construction documents and all the interior architecture documents. He also designed the interiors. Photo by Laura Hull. Patrick’s sketch of the stair hall at a ground-up, custom residence in Atherton, CA. Photo by Laura Hull. Patrick’s renderings are proudly displayed throughout our Los Angeles studio and are the first thing that our visitors notice (and emphatically admire). They have become emblematic of the artistry we bring to every project. And yet, while Patrick’s artistic style is easily evident in his renderings, his hand in designing our projects is purposefully indistinct in our final product. “We provide a custom, white glove service, so I never do the same thing twice. I’m constantly coming up with something new and working across a spectrum of styles,” Patrick describes his process. In our studio, project managers’ combined expertise spans a wide array of architectural styles, materials, and functions. As an interior architecture designer, Patrick must be up-to-date with technical specifications as diverse as conversion varnish and reverse osmosis water filters, while also having a mastery of almost every single style in Southern Californian (and even, national) residential architecture vernacular, an impressive feat that he repeatedly achieves. “As a studio, we are extremely versatile in our work, which on one hand, is hard because few people can look at pictures of our projects and immediately recognize that stylistically, ‘That’s a Tim Barber Ltd. house’,” Patrick notes. But it’s also really valuable in the sense that clients who hire Tim Barber Ltd. know that they aren’t getting a portfolio project, but rather, a superbly designed home that is uniquely their house, in their style. One of Tim Barber Ltd.’s most beloved images across the internet is of this study from a West Hollywood penthouse, designed by interior architecture designer Patrick Tennant. The light table/desk (left) was commissioned exclusively for this project from principal architect Tim Barber’s custom furniture firm, Auteur Furnishings. Photo by Laura Hull. Patrick is almost always involved in anything that’s a “wet room”, which we use to describe rooms that involve permanent surfaces like tile and stone, which are typically kitchens and bathrooms. “Some of our interior design collaborators want to do wet rooms, while others don’t, in which case, I do them.” This kitchen (and the penthouse in which it is located) were designed entirely by Patrick. Photo by Laura Hull. “I loved this project,” Patrick reflects, “because it’s purely Tim Barber Ltd. It was our vision the whole way through, and that’s why I knew I wanted a job with an architecture firm: I wanted to be involved in the design from day one.” Photo by Laura Hull. Do you have any questions for Patrick or another member of our team? Are there other roles or processes that you’d like us to clarify? Drop us a line in the comments below!